Joe Conti finished off the victory. POUGHKEEPSIE – On Saturday afternoon, the Vassar College baseball team wrapped up its seven-game homestand with a doubleheader against RPI. After winning the opener 5-4, the Brewers (10-12, 4-6 Liberty) dropped a 5-3 decision to the Engineers (10-10, 6-4 Liberty) in game two at Prentiss Field. RPI led 3-0 after three innings in game one, but Vassar rallied for a four-spot in the fourth to go ahead. Matt Martino got the inning started with a leadoff single, and he went to third on Taylor Smach’s double to right center. Evan Traush then singled in a run before the Brewers added another on a Matt McGannon squeeze bunt. After Robert Pinataro walked to load the bases, Daniel Bonfiglio lifted a sacrifice fly to center that tied the game. The Brewers took the lead on Sam Brinster’s pinch-hit RBI single one batter later. Vassar added an insurance tally in the fifth. Martino was hit by a pitch leading off the inning, took second on a passed ball, moved to third on Bryan Rubin’s bunt single, and scored on a Smach sacrifice fly. That run proved to be vital, as the Engineers threatened in the seventh against Joe Conti. After back-to-back hits put runners on first and third with nobody out, RBI pulled within 5-4 on Cole Paquin’s RBI groundout. Conti induced two more groundouts, however, leaving the tying run stranded at second and finishing off the victory. Traush finished 3-for-3 with a run scored and an RBI, while Martino scored twice. Starting pitcher Max Spencer (1-1) tossed 5.1 innings and picked up his first win of the season. He allowed three runs on seven hits with five strikeouts and four walks. Conti gave up a run and two hits in 1.2 innings of work for his first save of the season. For the Engineers, Richard Drum and Jack Vaccari both went 2-for-4 with a run scored, while Paquin was 1-for-3 with two runs scored and an RBI. Erick Zecha (0-4) got the start on the mound and lasted four innings. He surrendered five runs on seven hits, struck out two and walked one. Michael Castello yielded two hits over two shutout innings. In game two, RPI again jumped out to an early lead, scoring two in the first, one in the third and another in the fourth. However, the Brewers responded with a three-spot in the bottom of the fourth to trim their deficit to 4-3. Rubin started the rally with a leadoff triple, then scored when Gunnar Wildercrantz reached on an error. With two down, Martino ripped a double to left that knocked in a pair of runs and brought Vassar within one. It would remain 4-3 until the ninth, when the Engineers added another run on Michael Arboleda’s two-out RBI double. In the bottom of the ninth, Vassar put the tying runs on base when Smach doubled and Traush singled with one out. However, they would be left stranded, as RPI’s Chris Grome got a strikeout and a fly out to secure a split for the Engineers. Four Brewers had two hits in the contest, as the Brewers outhit RPI 12-7. Rubin and Blough each collected two hits and a run scored, while Martino drove in a pair. Starting pitcher Dawson Dullnig (0-2) took the loss after surrendering three runs on three hits and five walks in two-plus innings. 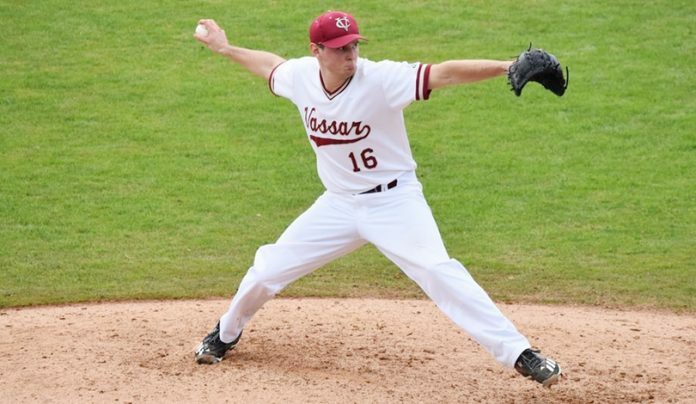 He was followed by four Vassar relievers, with Logan Willans hurling 3.1 scoreless, hitless innings. Willans struck out three and walked one. Joseph Curci paced the Engineers offensively, going 3-for-4 with three runs scored and two RBIs. Arbodela also had a pair of hits and drove in a run. Christopher Palmiero (4-0) went six innings, giving up three runs (one earned) on nine hits with four strikeouts and three walks. Grome finished the game with three innings of shutout relief. He allowed three hits and struck out three to pick up his second save of the year.